Nashville Predators general manager David Poile has been around the NHL long enough to know when it is time to turn the page. It doesn't mean, however that the page-turning will not be accomplished without a fair amount of pain and disappointment. Poile learned Wednesday morning that his All-Star defenseman, Ryan Suter, had exercised his rights as a free agent and joined the Minnesota Wild in a blockbuster move that also saw the top free-agent forward, Zach Parise, make exactly the same 13-year, $98-million commitment to Nashville's Western Conference rival. Until the phone rang with a contrite Suter at the other end -- "It was the toughest phone call that I have ever had to make in my life," Suter said -- Poile believed the foundation of his defense would be returning. "I think we met Ryan's desires and criteria on every front and, so, today is very, very disappointing," Poile said minutes after Suter announced his decision. 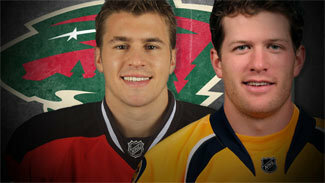 The only desire Poile couldn't match was Suter's wish to play someplace closer to his Wisconsin home. Someplace his family would be happiest. "Eventually it came down to where I felt my family would like to live," Suter said. "My wife is from Bloomington, [Minn.] and that had a lot to do with it." That was a pull that Poile couldn't counter. No amount of money, no fancy contract tricks, no promises of an enviable supporting cast -- starting with Norris Trophy finalist Shea Weber as a partner -- could counter the pull of family. Poile knows this, but he said he didn't know he was fighting a losing battle until he got the phone call. "Ryan has told me in every conversation that money was the not the most important criteria," Poile said. "He told me [Wednesday] that our offer was substantial. He told me it was not about the money when it came to the final decision. As I said to him, and this was all the things that we had talked about, I said I don't know why you are not signing with us and he told me it was for family reasons. "I guess that is where the disappointment comes in. I know family is important in all this ... I can't fight that or argue with that. The disappointing part is that is not what we talked about all year long." But there is no room for disappointment in professional hockey. Even in the offseason, it moves too fast to stand around and bemoan what could have been or what was lost. You have to make that next move, figure out the next transaction that will allow you to remain competitive. It is a lesson a young Poile, still cutting his teeth as a GM, learned from veteran Harry Sinden, one of his many mentors. It is a lesson Polie will put into practice in the coming days. He knows that if the Predators want to be as good as, if not better than, the team that made it to the Western Conference Semifinals for just the second time, he must find a way to fill the gaping hole in his roster. He knows it won't be easy. "Ryan played a prominent role on our team," Poile said. "He was assistant captain, played more minutes than any other player in the NHL, most on the power play than anybody else in the NHL, he was paired with a Norris Trophy finalist. I think this is a real missed opportunity. This could have gone down as the best defensive pair in National Hockey League history. They were certainly heading that way." "Ryan played a prominent role on our team. He was assistant captain, played more minutes than any other player in the NHL, most on the power play than anybody else in the NHL, he was paired with a Norris Trophy finalist. I think this is a real missed opportunity. This could have gone down as the best defensive pair in National Hockey League history. They were certainly heading that way." Now they are not. Instead, Poile must find some answers for his team -- whether they come from free agency or on the trade front. "I'm not just going to sign a player for the sake of signing a player," Poile said. "I want to get the right fit and we'll take the proper amount of time to do that. "I will do everything I can along with all our staff that we replace Ryan and stay a competitive team." The most important step in the process will be signing Weber, who is a restricted free agent. Poile admits the departure of Suter makes that proposition more difficult, but he plans to put his full resources toward it as soon as he finishes turning the page from Suter. "I need to talk to Shea and his representatives to go over all the dynamics of what this [Suter signing] does," Poile said. "I'm sure they are going to want to know what we are going to do going forward. This is one of those situations where you don't make a decision until you have to make a decision. I feel really good about Shea and I know he feels really good about Nashville. "This is not a perfect day to be talking to me or Shea about that right now."